Language translation software, to aid people for whom English is not their first language. Secure payment services websites, to allow members to use the online shop. All other external links will require Conference approval. 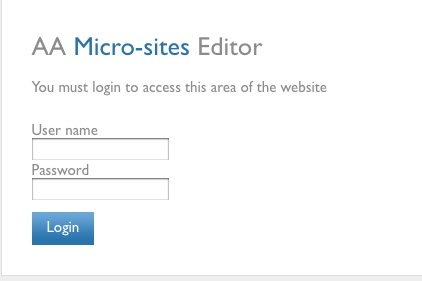 Editing the microsite requires a password, which will normally only be issued to the ECLO for the responsible body. A Microsite User Guide may be downloaded from here. If you need the login details, or if you have any problems, inform the Electronic Communications Sub Committee via this link. A new version of this guide has been published. It may be downloaded from here. Every meeting has a Group Reference Number - also known as 'uid', for Unique IDentification - which is asked for when you fill in a Pink Form to change details about your group. It is not necessary to know this number, but it is very useful to GSO staff when they are dealing with the Pink Forms. Until now, almost the only place where this number is given is on mail from GSO e.g. AA Service News. The uid is printed below the address. Now you can find a Group's uid from the Intergroup microsite. Within the microsite is a page listing all Intergroup meetings. When this page is called up, there is a further option to download the list in .PDF format. This list shows the uid for each group. Visit your Region's page and you will see the entry-point to your Intergroup microsite.